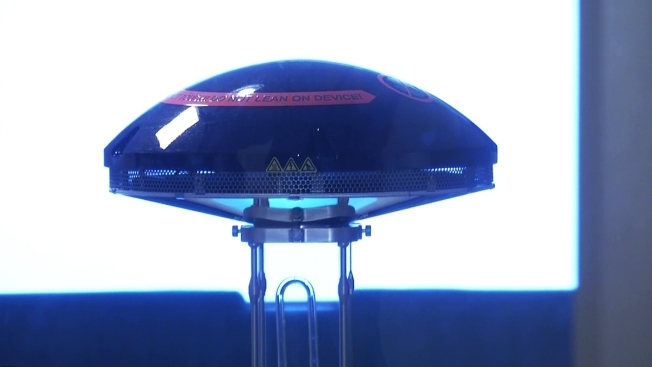 A germ-zapping robot named Thor is the latest tool being used to fight superbugs at medical centers around the country, including Palomar Hospital in Southern California. The robot is among 300 at hospitals and medical facilities nationwide helping to eliminate microorganisms that can lead to serious infections in patients. Officials said the organisms are becoming resistant to standard cleaning practices. The machine works by shining a UV light a thousand times more intense than sunlight on patient room surfaces, destroying any lingering viruses, bacteria, fungi and bacterial spores. Melinda Hart, spokeswoman for the manufacturer Xenex, said that even though staffers scrub down hospital rooms, some resistant and dangerous bacteria can still lurk. "Patient safety is our top priority," she explained. "These microorganisms are hard to kill and even the most thorough cleaning doesn’t catch them all." The machine costs $100,000, but it has paid off for Palomar Health. The hospital has seen a 30-percent decrease in infections, thanks to Thor. “We know it’s the best thing we can do for our patients,” said Susan Trout, disease preventionist for Palomar Health. Officials say the robot is an emerging tool in health care and they expect it to become increasingly common across the country.